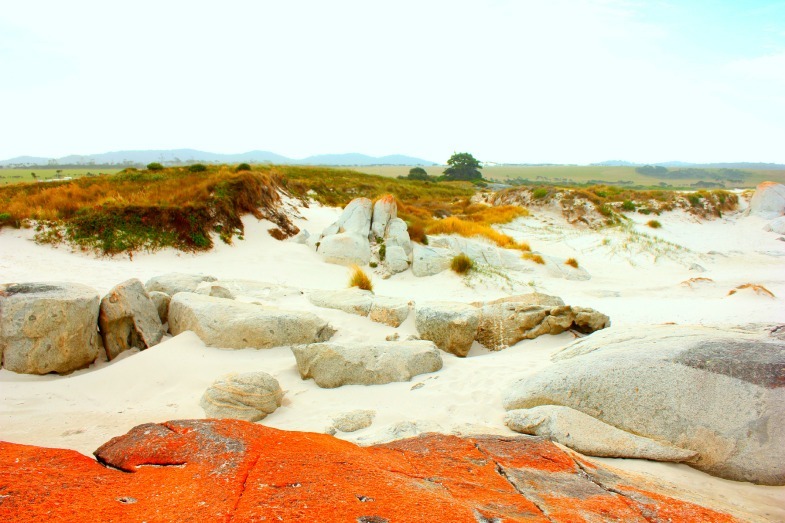 Sights & Sounds: Bay of Fires, Launceston Reviewed by acaciadee on February 1, 2015 . 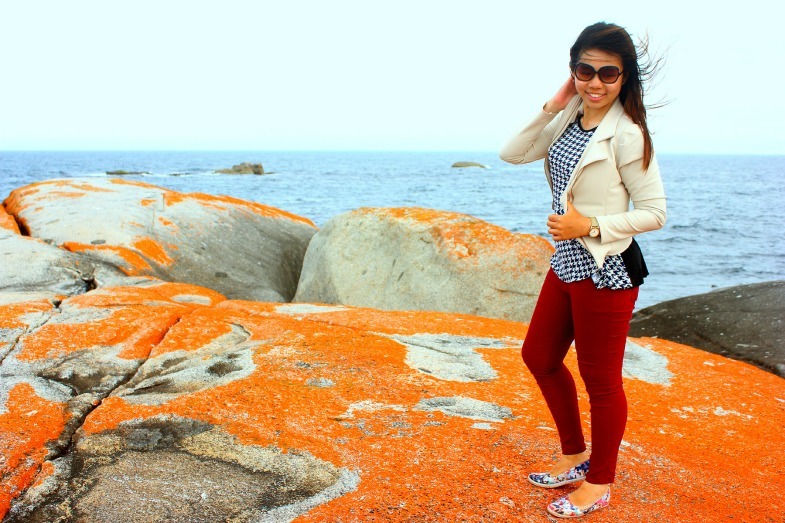 What is the Bay of Fires? Close to a 3 hours drive by taking the Tasman Highway from Launceston city, led us to St Helens Township on Cecilia Street. Making a turn onto Quail Street, brought us straight on to Binalong Bay Road and The Gardens Road. With the close- to- empty and fairly narrow costal driveway heading to the end of The Gardens Road, a glimpse of the “fires” of the bay can be spotted on the right, with the sea and cloudless sky as the backdrop. There is a small area for parking right at the end of the road that faces the Bay. 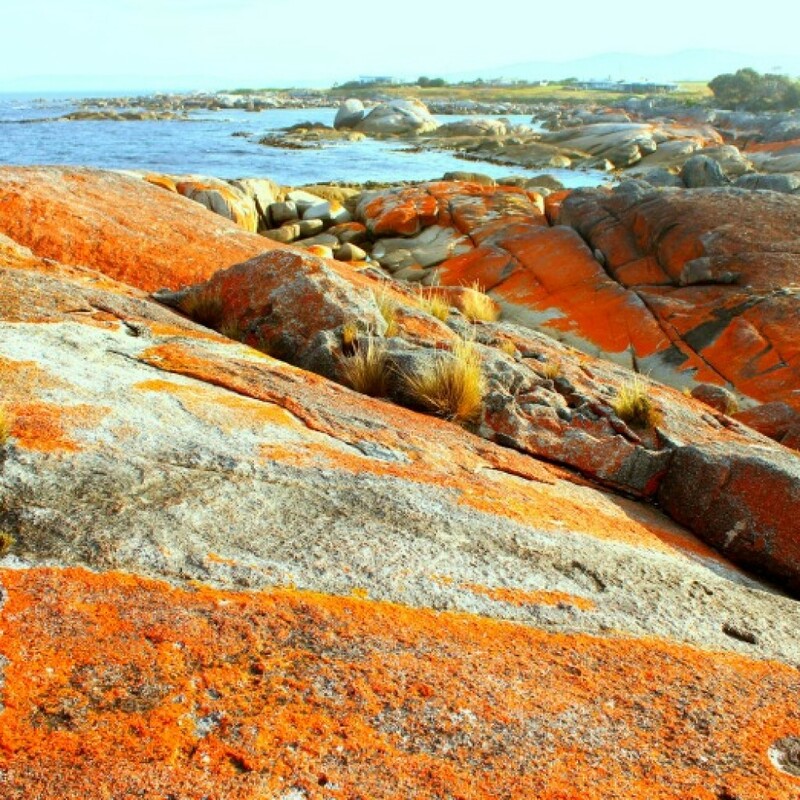 Located at the North-Eastern coast of Tasmania, this bay is sprawl from Binalong Bay to Eddystone Point. 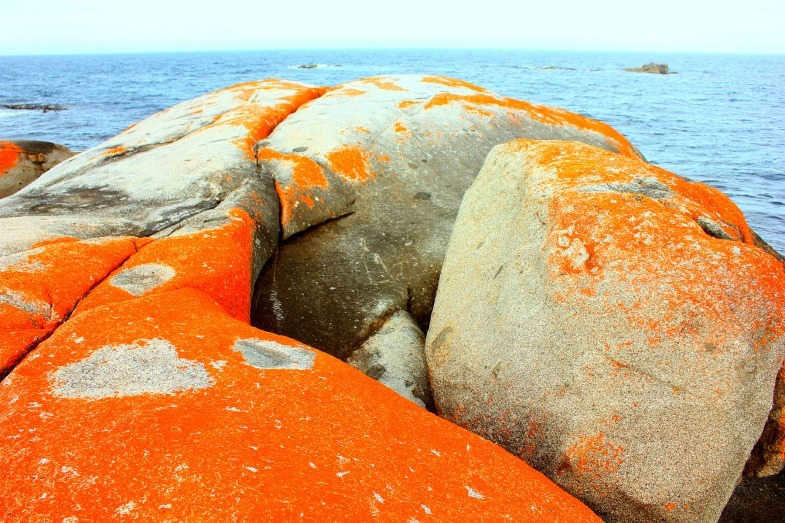 When I first heard of Bay of Fires, I thought the name originated from the fact that the rocks have patches of stained orange on them. 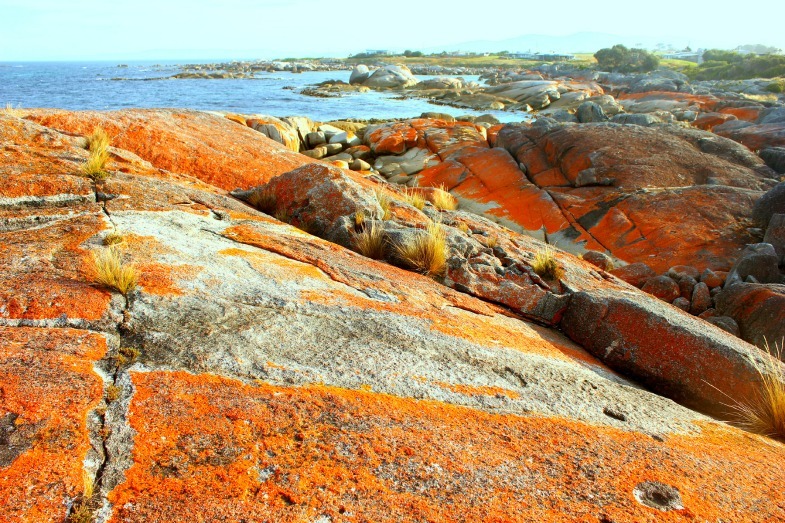 Hence, from afar, it looks like the Bay is indeed on fire- and the name “Bay of Fires”. Well… … While I still believe my theory had some logical and literal aspects to it; it is not the case. 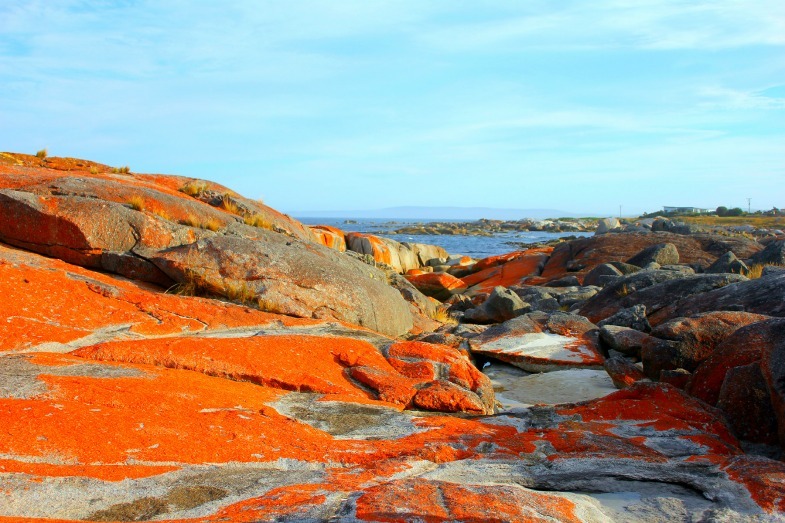 The Bay of Fires has its unusual name from a Captain in the 1700s after he noticed fire build-ups along the coast done by the indigenous people. We were welcomed by the coastal sea breeze just as we opened the vehicle door. Calming and extravagant as can be when the close- to- evening breeze lightly brush against our skin. With the orange stained rocks up ahead, we had to saunter through the partial grassy and sandy patch right at the front of the parking lot. The climate was impeccable- the wind howling strongly at us and I suddenly felt my spirits lifted. The afternoon sun slowly creeping into slumber, and the air turning cool and crisp, any normal person would feel the serenity of it all. 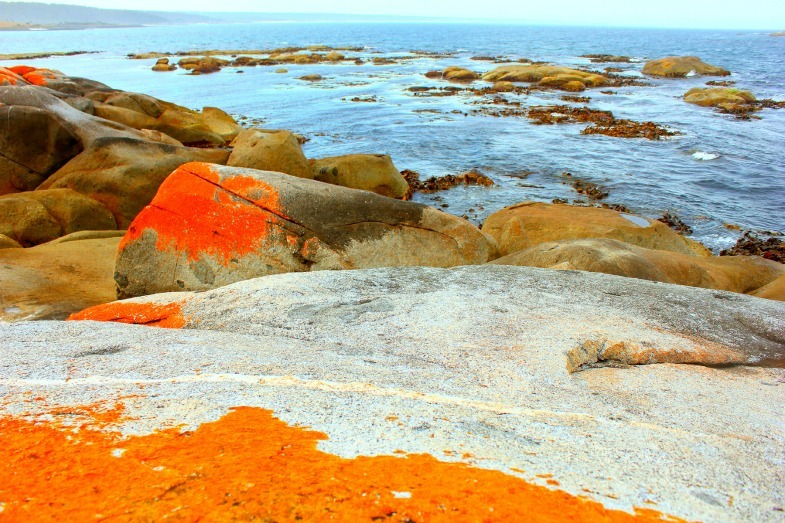 Enthralled by the stains on the rocks as we examined them up close, and taking a moment or two to soak in the sea beyond the horizon and the breeze that came with it. I can still recall we spend quite a bit of time (with legs stretched out towards the sea) keeping silent as we couldn’t tear our gaze from the beauty of Mother Nature. Just tranquil. As it was close the evening, the already orange sunset further enhance the salient details of the rocks making it all the more a dramatic landscape. 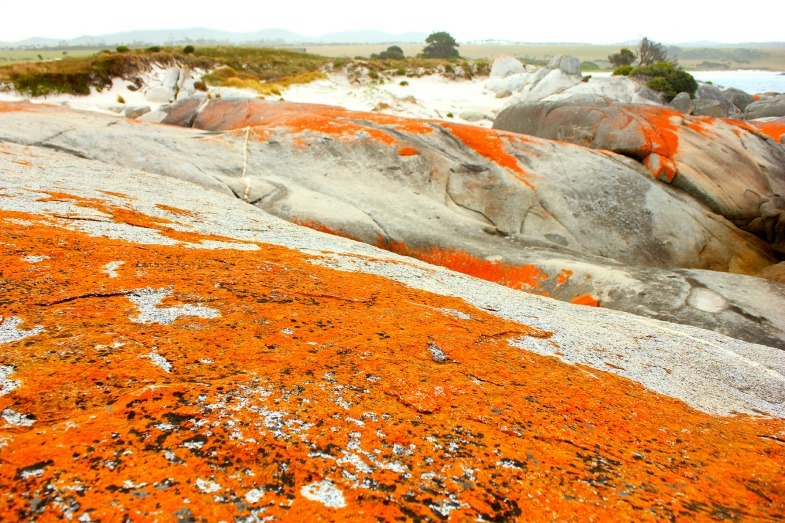 The stained granite of orange produced from lichen is definitely a place to be awed by. Positively a place pop by when in Launceston. This very quiet town surprised me in so many different ways at so many levels. An episode of The Walking Dead? As a city girl, I have definitely a lack of experience when it comes to rambling through small towns. I reckons the nature of a humble town reflects peace and calmness; where cars don’t just zoom by in a flash, and people take time to enjoy the nice walks on the streets with their family and pets. 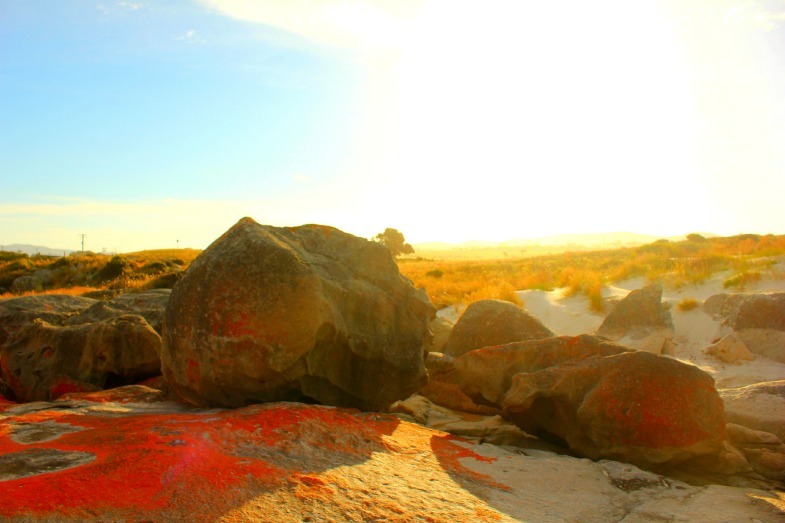 And these are the traits we saw when we were by at St Helens after a nice time over at Bay of Fires. Knowing these traits at the corner of my head, I was still pretty much amazed by the peacefulness and placidity of it all. I have never felt so much calmness amongst neon lights and shop houses before- though most shops have already called it a day when we were there. Not trying to be melodramatic here, and you may probably be thinking such small towns are so common- so why the big deal? But, back home, there isn’t such thing as small towns away from the city, and even when darkness falls, cars still zoom by every now and then, people still roam the streets, staccato laughter and loud chattering can be heard from a distance somewhere. The buzz on the streets would die down only closer into the night. This pizza place is definitely to die for. I am not kidding! The staff are so friendly and the food is just superbly beyond words. If not for the small bellies that we have, we would have order more. The orange sunset still shrouded the town when we entered the parlour. Choosing a seat that is close to the glass window, gave us a view of the empty street with a cross junction. Peaceful. I definitely cannot remember the exact name of the dishes we ordered, but let me just try to describe them. The first dish was a rich creamy carbonara base sauce with tortellini, and the next was a super spicy (to my taste buds) pizza with prawns and pepperoni (I think). To be honest, the taste of the pizza is way too spicy for me. Hence, I could not remember much of it, really. But I reckon it should be good because J had no complaints whatsoever. All I remember was me sipping water as I had a mouth of pizza each time. 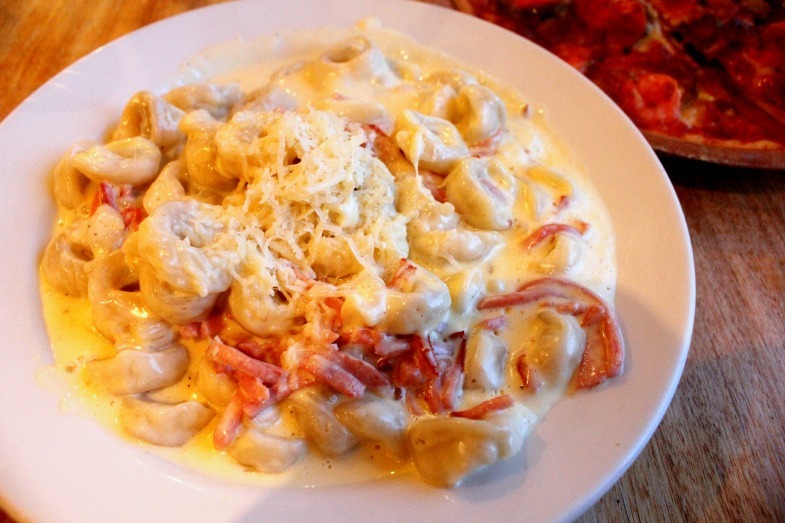 The star for the night is without said- the tortellini dish. This is the one to die for. The strong fragrant of melted cheese mixed in with the carbonara sauce is just heavenly. 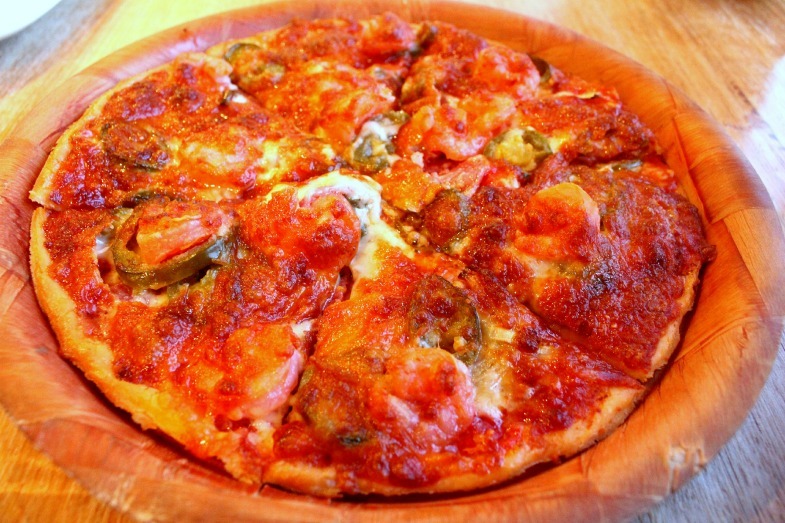 Rich, thick and creamy; Trimboli’s Pizza definitely did not stinge on the ingredients used in the dish. The sauce came with slices of ham all mixed in with it, so every mouthful is in a cosmos altogether. 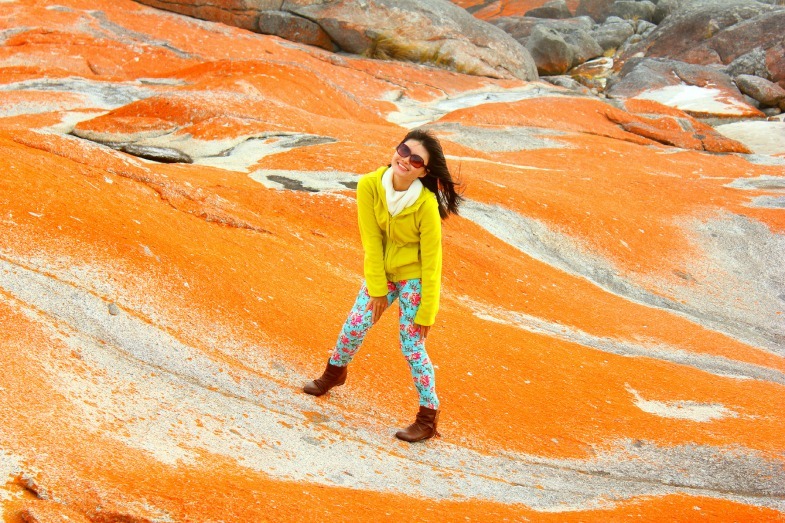 A savoury and exquisite dinner was undoubtedly the way to end of the day at the Bay of Fires and St Helens town.